Do you ever attend shower after shower wishing you would've found a more meaningful gift than a mundane registry selection? Or have you ever found yourself completely out of clever ideas when a holiday or birthday rolls around. Trust me, I hear you. In case you've been like me stuck in a little rut looking for unique, beautiful gifts for every occasion... look no more! My good friends at Hallmark have figured all the guess work out for us, and that deserves a dance break. 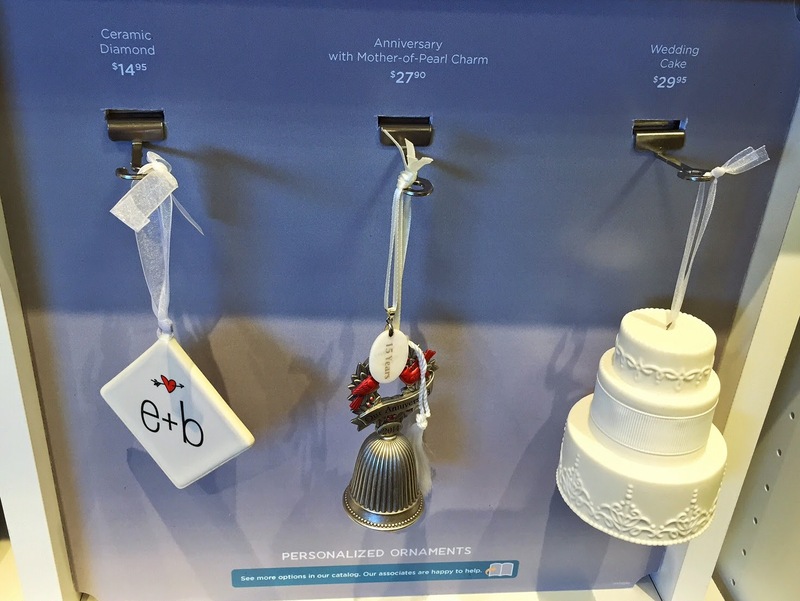 So those creative geniuses over at Hallmark have officially thought of everything. 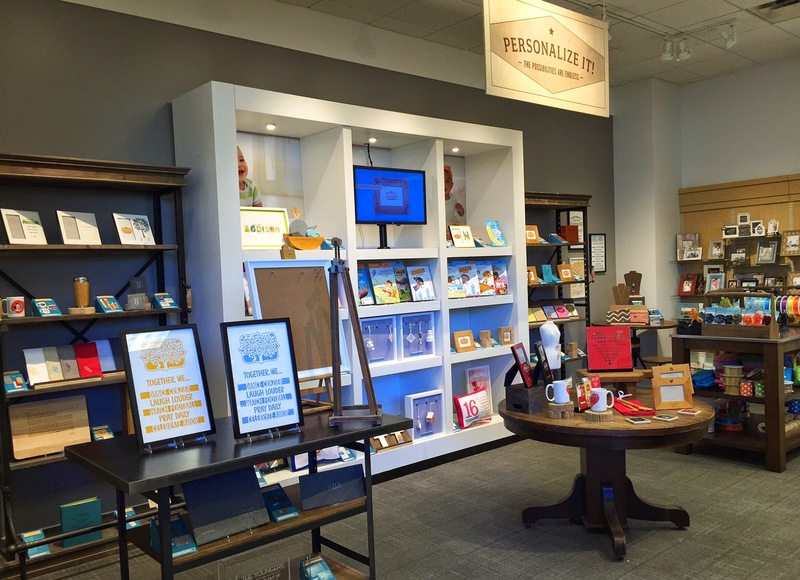 Not only do they have gorgeous gift stores full of great cards (I love the Studio Art collection! ), baby items, gourmet candy, delicious smelling candles, and aisles of options, you can now create beautiful one-of-a-kind gifts. May I present the Hallmark Customization Studio. 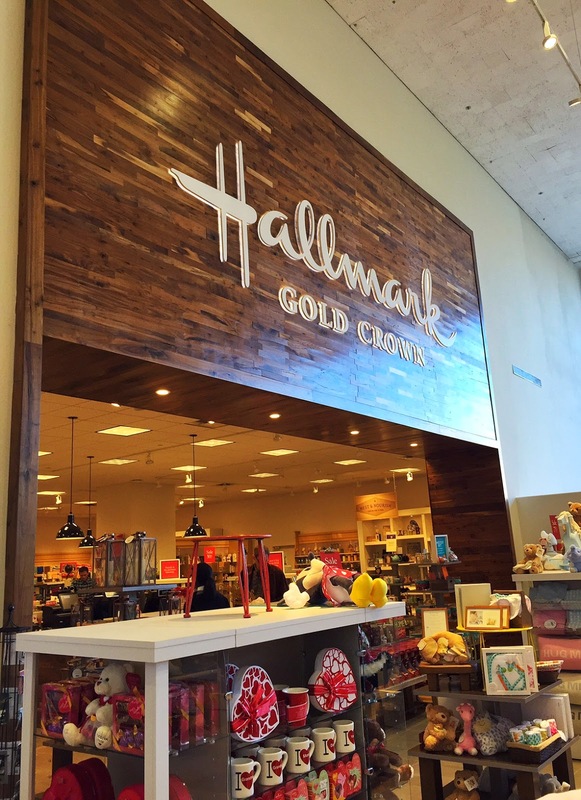 Kansas City is home for the beloved Hallmark brand, and I have the luxury of popping in the main Crown Center location on their campus anytime with my office being blocks away. So after hearing countless people rave about their latest genius idea, I knew I wanted to try it our for an upcoming wedding shower. Upon walking in to the gorgeously remodeled store, I browsed through practically the whole store (so many goodies on my wish list! ), before I got down to business. And let me tell you, my friends, it's a personalization mecca. They had buttery soft leather monogrammed goods that made me swoon. I loved the idea of gifting a newlywed couple monogrammed luggage tags to wish them a life of grand adventures. And that journal is just to die for. Hubs may be receiving that for Valentine's Day... shhh! The more I browsed around, the more I realized that they've thought of everything. 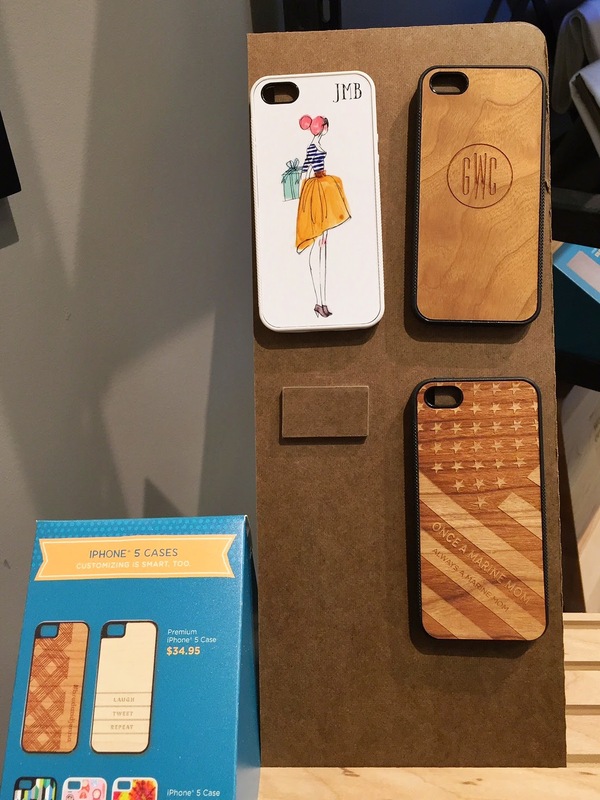 From cute cell phone cases to custom frames, travel mugs, and dinner napkins. hile browsing one of the many displays, I spotted engraved cutting boards, which I knew would be the perfect gift for my dear friends who love to cook delicious Italian food. It was easy super easy to pick my design, customize their last name, and order with the lovely lady helping me. She really surprised me when she said it would be in within 5 days - talk about quick turn around time! Now, I feel really excited to wrap this up for next weekend's shower. How cute are these Chirstmas tree ornaments? I think it would also be fun to gift one for an anniversary gift! The Customization Studio changes with the seasons, so they told me they had tons of options around the holidays - especially for families, baby's 1st Christmas, and more! One of my favorite lines they offer is for kiddos! How cool would it be to customize a beautifully illustrated children's book with the child's name? You can even pick out the character's skin tone, hair color, eye color, and name to make it extra special. I also loved the ultra soft lovey blankets attached to plush animals. The fabric is super high quality and you get to select embroidery colors, font, and style. 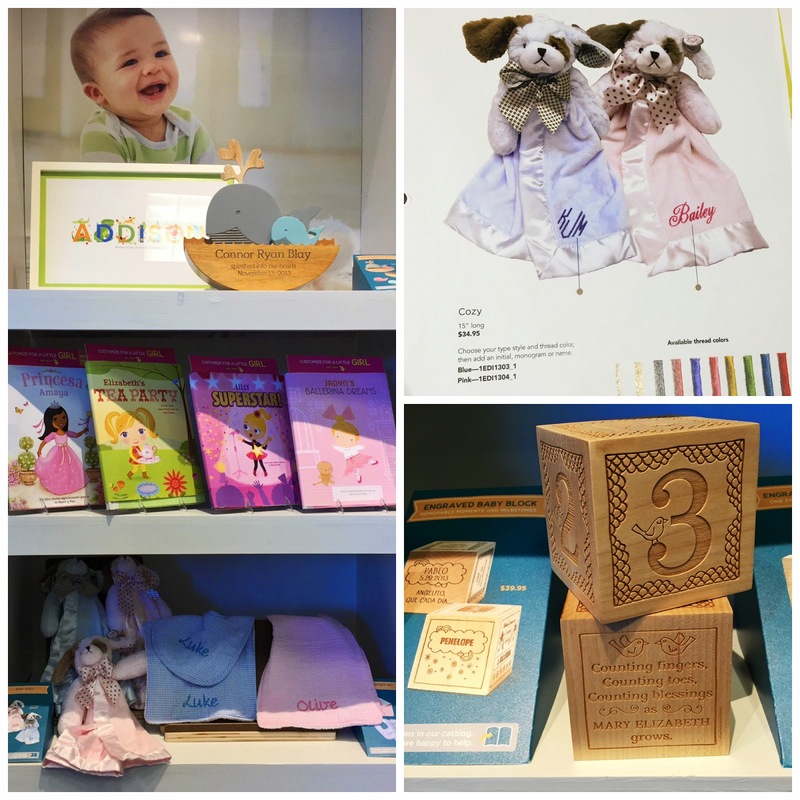 These will make perfect gifts for friends' babies! And did you see those cute wooden engraved blocks? They would be such a heartfelt gift for a mama/baby to receive and be perfect for a nursery shelf display. There was a beautiful display of gifts for the women in your life. 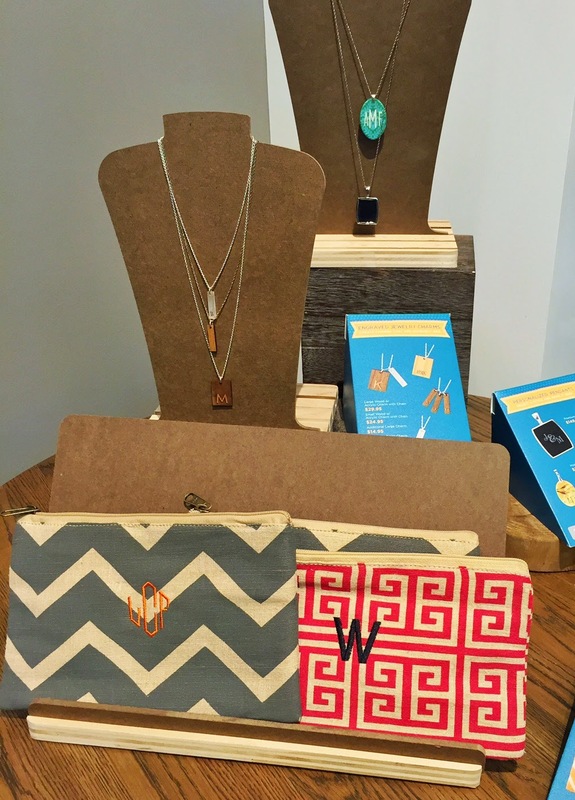 Pretty jewelry and patterned monogrammed bags. I instantly added the little trellis patterned bag to my wish list. It would be perfect as a pencil case, makeup bag, or work organizer. I even thought that if they would have existed around our wedding 2 years ago, they would have made such fun monogrammed bridesmaid gifts! The last thing that caught my eye on my way out was the laser cut artwork. 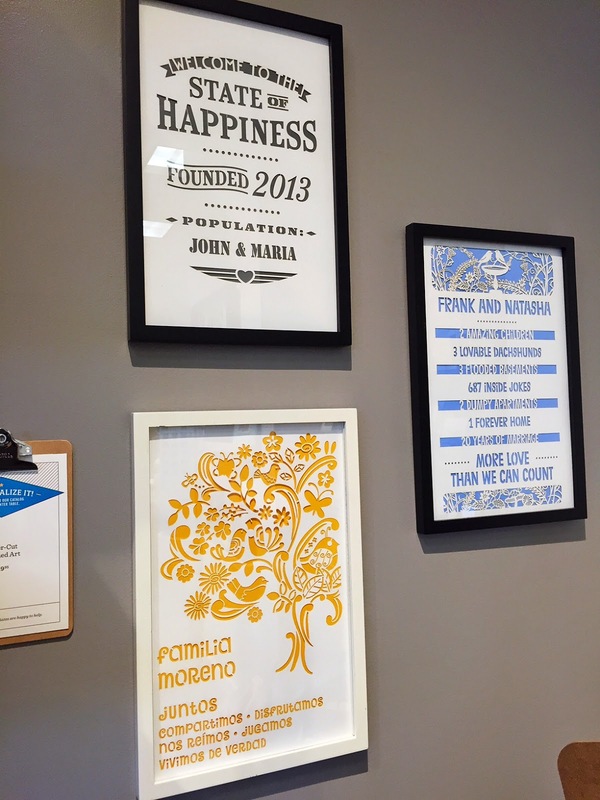 For $50 you get customized art work and that even includes being set in a high quality frame! So in case you're looking for the perfect unique gift for birthdays, anniversaries, weddings, holidays, or just because, definitely swing by your local Hallmark Gold Crown store that has a Cudtomization Studio. There are so many more gifts for you to browse! I am so thrilled with the beautiful quality of the personalized cutting board I ordered that I already can't wait to use the studio again soon. So today, I wanted to giveaway a $50 Hallmark gift card to a lucky reader so you can try out my latest obsession. Giveaway ends next Tuesday, Feb. 3rd at midnight, and you can tweet about it everyday for extra entrees... a win-win! Good luck & happy shopping!! I'd like to purchase stationary, something really pretty and personalized. I have this weird love of stationary! I am always looking for a gorgeous design that would be fun to read if a friend got my note! :) Good luck, Elle!! 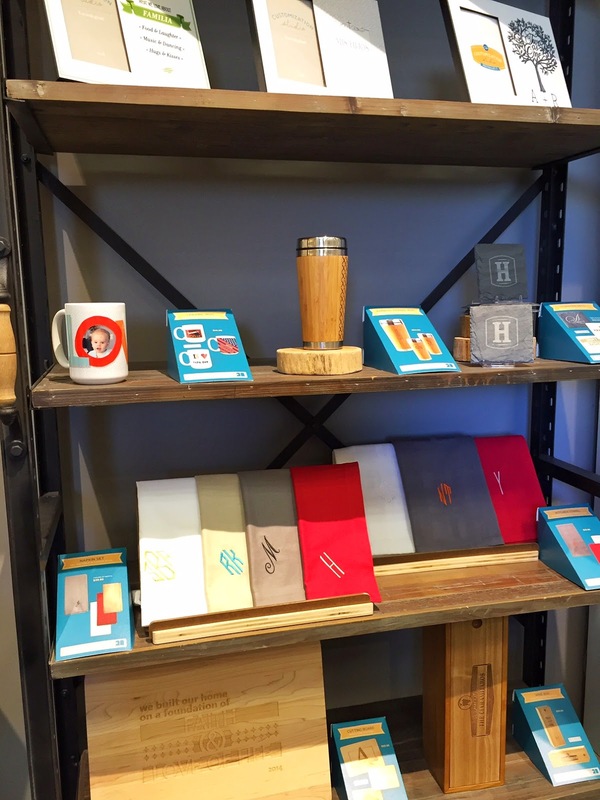 I would love some of those gifts-- like the cutting board! Would be perfect for the holidays! Those laser cuts are SOLID. Totally love the tree one. I would like to purchase the itty bittys Snoopy Stuffed Animal. I love giving out cards to my family and friends and I think Hallmark has the best cards that convey the way I feel! I love buying their cards. I love to buy gifts for the ladies in my family there! I love their ornament selection! I would love to purchase books and a candle! I'd love to buy some birthday cards! Definitely a few cards but wrapping paper as well! I would buy some cards. Wow, lots of great stuff! The husband could use a new wallet and I love that three layer necklace too. I would buy some of their charms for my best friend. I would love to buy a Valentine's gift for my hubby. I would love to get a customize illustrated children's book with my little nieces name, she loves her books, would make a great gift for her. I'll buy birthday cards and ornaments. I'd like to purchase some wrapping paper. I would love to get my mom a pretty frame from Hallmark. I love the December Tanzanite Birthstone Bangle Bracelet! Oh such neat things they have now!! I would love to get the little trellis patterned bag!! That is so cute! I also would stock up on a few cards for upcoming birthdays! I would love to get my son one of their leather monogrammed goods. Oh wow, there are so many great things to choose from!! 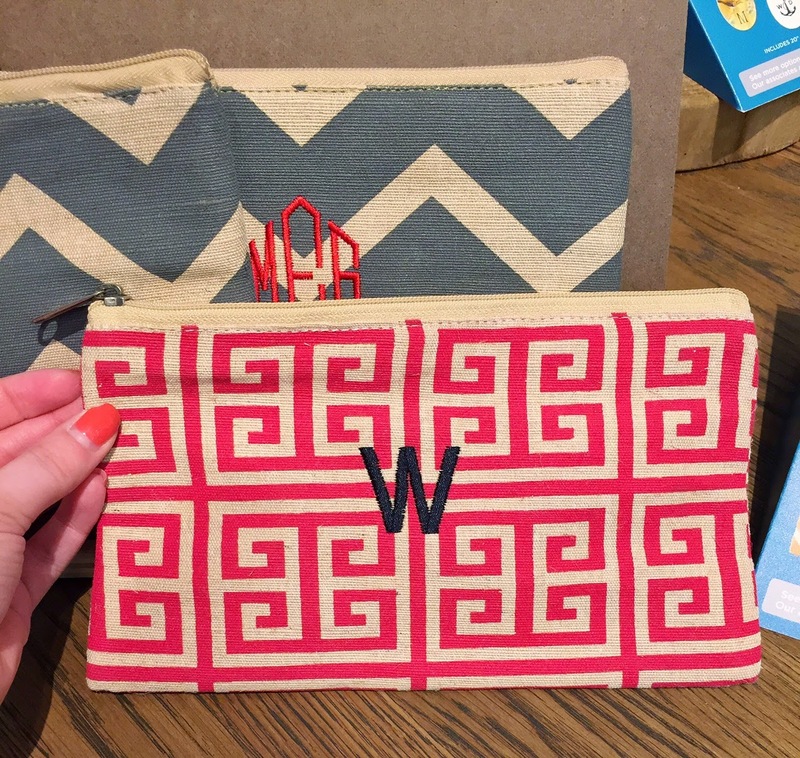 I really love the leather monogrammed portfolios and luggage tags.. and the monogrammed bags. Sucker for monograms. 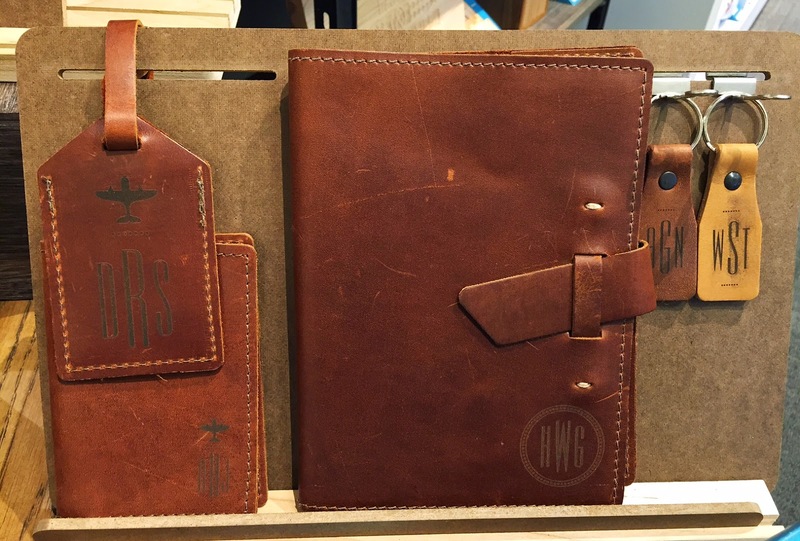 Something leathery for sure - love that planner! I never knew Hallmark did such fun things! If I win, I would love to get a cool bag (like you showed) or a mug! I love everything that Hallmark has to offer. We have a store here in Oxford and I could literally spend a few hours in there, just reading cards and looking at all their gifts! SO fun. I don't know what I'd buy, but I know it would be a hard decision with all the awesomeness they have! Just visited the HMK store on the Plaza a couple weeks ago, they have the cutest stuff! I would love to stock up on birthday cards! Hallmark has some many awesome things! It would be very hard to pick! It is always a great place to find fun gifts! i would buy cards for the next year! I love that journal. I have been searching for a cute one! The cutwork art is lovely. A photo frame for my mom!